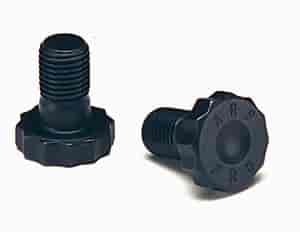 ARP Ring Gear Bolts Ford 9"
ARP's Ring Gear Bolts are designed to withhold the tremendous shock loads generated at launch by most any drag racing vehicle equipped with today’s sticky tire compounds or the acceleration and deceleration of oval track cars. These bolts are forged from premium grade 8740 chrome moly steel and are heat-treated to a nominal rating of 190,000 psi tensile strength. Available to fit most any ring gear setups ranging from popular 9? Ford, GM 10- & 12-bolt rear ends to the beefy Strange differentials found in Top Fuel and Funny Car applications. Specially hardened, precision-ground washers are included where required. 250-3002 is rated 4.5 out of 5 by 2. Rated 5 out of 5 by larp1972 from great product the only problem was the bolt shoulder was too long. sb chev head bolt washers made them just right. Rated 4 out of 5 by dutchman from too much shoulder needs a shim/washer to allow bolt to tighten without bottoming out on shoulder. found that sb chev head bolt washers work perfectly.